The U.K.'s Telegraph today published an obituary for Henry Chadwick, the prolific Anglican historian of the Early Church. The Telegraph describes him as "a man sympathetic to, and very well acquainted with, the Roman Catholic Church; a traditionalist who appeared to adhere to no particular group within Anglicanism; and an advocate of ecumenism whose actual sympathies lay tantalisingly beyond sight." The Times Online also has an obituary. The word of God helps us, once again, to discover the mysterious and profound meaning of the Church's path in the world. In fact ‘‘the subject of one of the most important visions of the Book of Revelation is [the] Lamb in the act of opening a scroll, previously closed with seven seals that no one had been able to break open. John is even shown in tears, for he finds no one worthy of opening the scroll or reading it (cf. Rev 5:4). History remains indecipherable, incomprehensible. No one can read it. Perhaps John's weeping before the mystery of a history so obscure expresses the Asian Churches' dismay at God's silence in the face of the persecutions to which they were exposed at the time. It is a dismay that can clearly mirror our consternation in the face of the serious difficulties, misunderstandings and hostility that the Church also suffers today in various parts of the world. These are trials that the Church does not of course deserve, just as Jesus himself did not deserve his torture. However, they reveal both the wickedness of man, when he abandons himself to the promptings of evil, and also the superior ordering of events on God's part''. - Pope Benedict XVI, To the Bishops, Priests, Consecrated Persons and Lay Faithful of the Catholic Church in the People's Republic of China, May 27, 2007 (released today). From last Sunday's Lenten Conference at Notre Dame Cathedral of Paris, here is an English translation of excerpts from the lecture given by Father Gérard Pelletier, titled "The Church Can Look Its Past in the Face" (translated from a transcript of those excerpts by La-Croix). Father Pelletier is a doctor in history, professor at the Studium Notre Dame (the seminary of Paris) and head of the Maison Saint-Louis-en-l'Ile (one of 8 houses of seminarians of the seminary of Paris). The lectures can be viewed online on the KTO website. A schedule of the series is posted in English here. "When the Christian reflects upon the role of memory, it first occurs to him that the people of Israel are invited to call to remembrance unceasingly the great deeds of God in their history; then that Christ will say to His disciples on the evening of the Last Supper in instituting the Eucharist: "Do this in memory of Me" (Luke 22:19); finally that the Lord promised to these same disciples that they would not be alone in their act of memory: "The Paraclete, the Holy Spirit, whom the Father will send in My name, he will teach you all things and bring to your remembrance everything that I said to you" (John 14:26). At the realest moment of the sacramental encounter between Christ and the believer, an act of memory is presented: truth and memory are forever linked in the Christian life, shedding light upon the entirety of the other dimensions of existence . . . This memory, like every element of the past, belongs to the field of history, and makes possible this historical science which interests us today: with its methods, its safety, its wish for objectivity moderated by the clear awareness of what the historian brings in his questioning about the past. But this memory leads us further into what we call, in Christian practice, “Tradition” . . . This Tradition in action is distinct from what we call history; but history, the act of memory of what the Church transmits to us, belongs to Tradition, is an element of it . . . In fact, when Tradition and history are badly articulated, several sicknesses can appear in the life of the Church. The History of the Church Suffers from Partial and Reductive Interpretations. In the first direction, the memory of certain elements of thought and of the Church’s life can invade Tradition and become confused with it to the point of locking it into conventional formulas . . . In the contrary direction, the role of history and that of memory can also be treated with a scientific approach that reduces the authenticity of Tradition and thus of the act of Faith, bordering on all the "modernisms" of history . . . Between these two extremes, we find a great number of currents of thought that ultimately take one point of Tradition and create an entire system from it, tending to take the place of Tradition itself . . . The history of the Church, particularly since the century of lights, suffers from partial and reductive interpretations concerning the Crusades or the Inquisition, even now concerning the Second World War . . .
On each one of these points, the work with objective facts can be distorted by a more or less complete incomprehension of Christian Tradition, and thus of what is, in truth, the Church’s mission in this world. To know this mission makes it possible to leave behind alternating mediocrities. . . . . The Church’s maternal memory is sacramental in the sense in which it is memory of the effective action of God in our human histories. We have, as believers, the privilege and the right to look at the history of humanity, discovering in it, while scrutinizing it, the signs of the presence and working of God. And we know that each man, in his uniqueness and his irreducible value, is set before God in history, in a given time . . . If one takes the option to secularize the look at history, which is scientifically legitimate, it no less remains the case that there is a divine providence, too much forgotten today . . .
To point out that God is providence is not to leave the field of history, a social science that lives in the strict discipline of tools for understanding provided by its method . . . No, we do not have the right to ideology, and that must be at the center of our methods, most particularly in these times when the Church can seem to be a minority and mistreated. It would be dangerous to believe that all means are acceptable to defend ourselves. But even in the context of the historian’s asceticism, the role of theology intervenes. He cannot understand the life of the Church if he works by completely disregarding ways of thinking and believing about this. It will no longer be a question of producing a history called "confessional". Again and always, it will be about establishing the truth, because it frees, while pressing all men of good conscience forward towards the good of humanity . . . The Spirit of God Acts in World History. At the heart of this relation between man’s truth and God’s truth, memory is inseparable from forgiveness asked, received as much as possible, lived in depth. The Church can and must ask forgiveness before this world for elements of its past, and purify its collective conscience. That is the meaning of the steps of repentance and forgiveness which marked the pontificate of John Paul II . . . . The Church can look its past in the face, to submit acts of discernment, not about men, whose judgment belongs to God alone, but about objective actions and facts that do not correspond to the message of the Gospel. John Paul II did not have to judge Godefroy de Bouillon’s taking of Jerusalem, nor judge St. Pius V’s reforming the Roman Inquisition, and in fact the text of the prayer did not judge anyone. But it can ask forgiveness for all the times when Christians did not respect the religious conscience of their contemporaries . . . John Paul II’s steps purified our memories and allowed us to place ourselves in truth in contemporary debates. . .
All things considered, since the Spirit of God acts in the history of the world, we can dare to affirm that the Holy Spirit is there to clarify the work of the historian who wants to know, to understand, the past elements of the Revelation, the past elements of the history of the Church – we could say Churches – for better serving the man of today in his walk of Faith. That the historian works with an asceticism of the truth does not prevent him from having to raise his eyes up towards that which can give meaning to so many lives of men and women, and to be aware of it . . . "
A quote from Bl. Julian of Norwich: "He Is the Teaching, He Is the Teacher"
"Every soul could live in inconceivable and sublime exaltation if all were contented with God’s purpose for them. Yes, if we could leave that divine hand to do its work we could all attain the height of perfection. It is offered to us all, we have only to reach out our hand for it. There is not a living soul whose nature is not uniquely sacred, so that all can live, act and speak sublimely. Souls have only to follow each other along the same path and divine action will make each one, though ordinary, unique. "How can I explain to your creatures, O heavenly Father, what I am proposing to them? Is it possible that, possessing such a precious gift and being able to enrich the world, I must watch souls drying up like plants in a desert? Come, simple souls, without a trace of piety, talent or even the most elementary instruction or system, and with no understanding of spiritual matters, who are amazed and overwhelmed by the eloquence of the learned; come, I will show you how to outshine those clever scholars, and will set you so well on your way to perfection that you will always find it at your feet, over your head and all around you. I will unite you to God and you will be led by the hand if you do what I tell you. Come, not only to look at a map of the spiritual country, but to possess it and walk in it without fear of losing your way. Come, not to study the history of God’s divine action, but to be its object; not to learn what it has achieved throughout the centuries and still does, but simply to be the subject of its operation. There is no need to bother about what has been told to others; there are words for you alone." Sometimes God’s will for us is simple. Sometimes tasks that appear ordinary become extraordinary in God’s working. Mary was a young girl who became pregnant and was the mother of Jesus. In her mothering, the angel Gabriel was sent to her and said, “Hail, favored one! The Lord is with you." (Luke 1:28). Jean-Pierre de Caussade, in the passage quoted above, wrote about how God gives each Christian a unique combination of gifts so that God can work through each one of us. “He ascended up on high . . . he gave gifts to men.” (Eph. 4:8) Fr. De Caussade wrote, “Come, not to study the history of God’s divine action, but to be its object; not to learn what it has achieved throughout the centuries and still does, but simply to be the subject of its operation.” Mary was the subject of the operation of unique divine action when she conceived a child through the Holy Spirit. All Christians are the subject of the operation of some measure of divine action when we allow God to use us as His instruments through the unique combination of gifts that He has given to us for that purpose. We benefit from reading about the history of the Church and the lives of the saints, both in that they are role models and in seeking the intercession of some of them. However, it is important to not only look at God’s power in history, but also at God’s working in our own lives now, individually and as the body of Christ. One amazed and overwhelmed by the eloquence of Augustine or the brilliance of Aquinas might yet “outshine those clever scholars”, in the sense in which De Caussade meant it, when contented with God’s will. 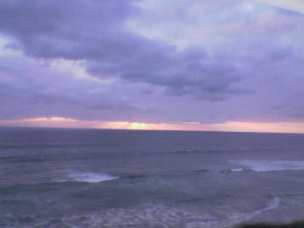 Photo: Sunset over the ocean near Del Mar, taken from the Coaster Train, May 4, 2006. Dr. Ed Peters' canon law blog In the Light of the Law has a lengthy and informative post about the question of whether women can have their feet washed in the Holy Thursday foot washing. In his post, titled Our Lenten foot fight: it's time to resolve the mandatum rubric debate, Ed addresses the canon law issues and some history of the issue. After explaining the present debate, and explaining that "this matter is purely one of ecclesiastical law (which means it is changeable, albeit only by Rome per 1983 CIC 838)", Ed expresses a hope that the matter will be studied and resolved outside of Lent. He concludes: "There are many more important things to ponder during the Church's holiest season." It is an interesting and informative article about an issue that sometimes has been divisive during Lent. Although my area of practice has never included canon law, and I thus accept Ed's explanation of the legal issue without question, I will offer an eighth century letter showing that the question of washing women's feet has been asked at least as far back as the bishopric of St. Boniface. Personally, over the last decade, I have spent Holy Thursday in parishes where the foot washing was limited to men and in one Episcopal Church parish where it included women, and was content with either decision. It is the sort of issue in which I am inclined to follow the preference of my own priest and bishop while my own interest lies in the spiritual meaning of Holy Week. However, it would be an interesting historical topic for someone to put together a study of the history of this rite, when it first began to be observed as a rite on Holy Thursday, and how its Biblical meaning has been understood over the centuries. 1987 - USCCB declared that it has become customary in some places to allow both men's and women's feet to be washed. While boston.com may be correct that the Holy Thursday liturgy including this rite has a thirteenth century origin, the rite itself has a much older history associated with Holy Thursday. In the middle of the eighth century, Bishop/St. Boniface of Mainz/Devon asked Pope Zacharias whether it was permissible for nuns to wash each other's feet on Holy Thursday, presumably in abbeys where there were no men's feet to wash. The Pope's answer, written November 4, 751, is preserved in the collection of The Letters of St. Boniface. That was all that Pope Zacaharias had to say about the matter in the course of a lengthy letter. He said nothing about the rite symbolizing the twelve Apostles, a frequent basis now for arguing that only men should be included. A careful study of the rite would have to go back even before St. Boniface and the eighth century, at least as far back as the fourth century to follow how the rite moved from a regional part of the baptismal rite to a part of the Holy Thursday observance, to its present place in the liturgy. "As regards the significance of the action, Ambrose appears to teach that, while personal or actual sin is removed by baptism, transmitted or original sin is removed by the 'foot-washing'; thus, of Peter he says that 'his foot is washed that hereditary sins may be removed, for our own sins are loosed through baptism'. The author of De Sacramentis silently corrects this doctrine by affirming with emphasis that all sins are washed away in baptism; he explains the ceremony, partly as a lesson in humility, and partly as a means of special sanctification at that point where Adam was poisoned and tripped up by the serpent. Augustine also regards the action as a lesson in humility, but not as an essential part of the sacrament of baptism." By the eighth century, when St. Boniface wrote to Pope Zachariah, the rite was no longer part of the baptismal rite, and the question of washing women's feet, at least in women's religious houses, existed then. There is a much older issue about including women than is often understood. I do agree with Ed Peters that a careful study and resolution of the issue, outside of Lent, would be beneficial. Alvin Kimel at Pontifications has posted an article by William J. Tighe, Ph.D., entitled Women's Ordination and Fantasy History: Or How to Invent a Novel "Tradition". It is a response to an article published on January 25th on the Sojourners’s website, which was written by Sandra Dufield, entitled “The real tradition of women and church leadership.” Prof. Tighe's analysis of the supposed Bishop(ess) Theodora, one of four women depicted on the walls of the Church of St. Praxedis in Rome is quite interesting, and provoked some interesting and amusing comments. "If somebody asks me, "What is best in this life?" I shall answer, "Friends!" And among them, which ones are to be given preference? I would say: "Those who are good!" "And which ones shall you name first?" "I would not place anyone ahead of you in virtue, I am sure!" I do not write this to flatter Your Lordship but to honor your qualities which we proclaim, omitting nothing as far as it is in our power; we are not only your heralds, but also your fellow combatants, inasmuch as our prayers confer upon you a real power." (translated by Georges Barrois, from The Fathers Speak, St. Vladimir's Seminary Press. "I do not know whether the Divinity has granted anything better to mortals than friends, if only they are the ones who seem suitably sought out and suitably kept. Fortunate day, fortunate hour, in which we were permitted to know the man, the recollection of whose name has deflected all annoyances from us. Indeed, if I should enjoy his presence occasionally, not without cause would I think myself more blessed. In order to accomplish this I had established for myself a not unworthy abode in Italy. But blind fortune, pressing down with its mists, enwraps the world, and I know not whether it will cast me down or direct me on, tending as I am now in this direction, now in that. But the features of my friend remain fixed in my heart. I mean him who is my lord and father -- Gerald -- whose counsel we will transform into deeds." (translated by Harriet Lattin, in The Letters of Gerbert, Columbia University Press, 1959. ZENIT reported today that the Vatican secret archives are now accessible online. The ZENIT article is here. To access the documents, go to the Vatican's website, http://www.vatican.va/, and click on "Vatican Secret Archives" under "Focus" (on the right side of the page). The oldest accessible document is from the eighth century. There is an uninterrupted series of documents from 1198. "Stone by stone, the City of God is thus built up within world history, from below and from above. All its constituent stone comes to it from below, but no single block can take its place in the fabric of the building except it be brought there and placed in position by a power which emanates from God and from his holy Servant Jesus Christ. . . . The history of the Church considered as the City of God would thus be in effect the history of holiness. It would rather resemble chapter 11 of the Epistle to the Hebrews. But whilst this chapter only retains from sacred history a few outstanding examples concerning this history at the level of the progressive establishment of the covenant relationship, the history of the Church is rather that of the achievement or consolidation of this relationship, already perfectly established, but not yet fully consummated. This history could be formulated, for instance, as in Hebrews 11: "It was by faith, fulfilling the Gospel and by a 'mission' of the Holy Spirit, that the Council of Nicaea ...; it was by faith ... that St. Augustine ...; by faith ... that Francis Xavier ...; by faith ... that Thérèse Martin, and so on. . . . If we could chart these, the result might read, for example: "23 November 1654, Paris, Blaise Pascal ...; 25 December 1886, Lisieux, at Midnight Mass, Thérèse Martin makes her first communion and experiences a complete interior conversion, Paris, at Vespers, Paul Claudel receives the faith." We mention only two or three known facts but there are a myriad known to God and featuring in his Book of Life. What a vast extent, what deep riches there are in this history, where nevertheless only one overmastering end is in view: the covenant relationship established in Jesus Christ, which is the Gospel. "The time of the Church is thus the time of those responses that are stirred up in us, in the order of truth and love, by the "divine missions" or visitations of the God who is, who was and who is to come, by which he brings this relationship, revealed and definitively established in Christ, to its final fulfilment. Each moment of this time is thus the present reality of the relationship, the active presence of what brought it about once and for all, and at the same time the beginning of its final consummation." - Yves M.-J. Congar, Tradition and Traditions: An Historical Essay and A Theological Essay, The MacMillan Company, 1967, pp. 262-264; sold now as a Basilica Press Reprint Edition.